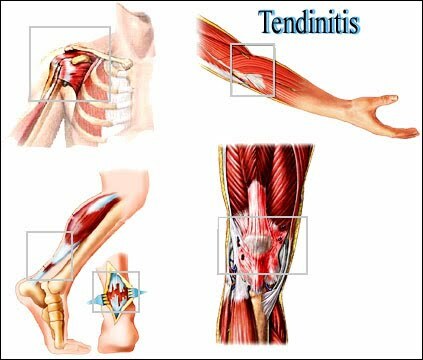 Tendinitis is a condition caused by the tearing of tendon fibers and subsequent inflammation in the tendon. Tendons are the strong connective tissue that connect muscle to bone. When a muscle contracts, it pulls on the tendon, which is composed of tissue that cannot stretch. The tendon then transmits that pulling force to the bone and moves the bone, producing movement. Tendinitis usually results from excessive repeated demands placed on the tendon by the muscle. Tendinitis is not usually caused by a sudden injury; it is more commonly a result of a long period of overuse. Tendinitis occurs frequently with active individuals and those whose occupational tasks require repetitive motion. Repeated overuse of the tendon will cause small tears to develop in the tendon fibers. As a result, the body will initiate the injury repair process in the area and lay down scar tissue. Inflammation will develop in the area as part of the injury repair process. Inflammation increases the blood supply, bringing nutrients to the damaged tissues along with infection-fighting agents. The result is swelling, tenderness, pain, and heat. Redness may occur if the injury is close to the skin. Since many cases of tendinitis result from chronic inflammatory conditions that develop from long periods of overuse, the inflammatory process is not as exaggerated as with an acute injury. Therefore swelling, heat, and redness are not always visible in a tendinitis complaint because the inflammation is really at a low level. Recent research has found that tendinitis sometimes develops as a side effect of treatment with quinolones, which are a group of antibiotics frequently used to treat bacterial infections. The tendon most likely to be affected by these drugs is the Achilles tendon, and the tendinitis usually develops within the first few weeks of antibiotic treatment. 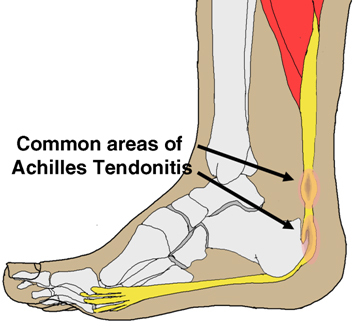 tendinitis, which affects the tendon just above the heel of the foot. While tennis elbow occurs more often in workers than in athletes (in spite of its name), tendinitis affecting the Achilles tendon is almost always related to sports. Tendinitis in the shoulder area is almost always found in workers who frequently carry heavy loads as part of their job. Tendinitis is most often diagnosed by evaluating factors in the patient’s history that indicate muscular overuse. Tendinitis will often develop when an individual suddenly increases his or her level of activity without adequate training or conditioning. This occurs frequently in occupational and recreational settings. In addition to evaluating factors in the patient’s history that are likely to lead to tendinitis, the clinician may use several physical examination procedures. Most tendons are near the surface of the skin and therefore can be easily palpated (touched or pressed in order to make a diagnosis), especially by practitioners of manual therapy who have highly developed palpation skills. Pressure placed directly on these tendons is likely to cause discomfort. In addition, the practitioner may ask the patient to contract the muscle attached to the tendon, usually against resistance, to see if this maneuver causes pain. Ice is often advocated for tendinitis when the tendon is in an irritated state. Ice is particularly useful for limiting inflammation in the tendon. Ice may be applied by placing a bag of ice on the skin. It may also be applied directly to the skin using an ice cube wrapped in a paper towel or ice frozen in a paper cup with the top portion of the cup peeled away to expose the ice. An ice massage rubbing the skin and underlying tissue with ice in a slow, circular, or back-and-forth motion—will cool the injured area quickly. If ice is applied to the skin without a barrier between the ice and the skin, the patient should be carefully monitored so that frostbite does not occur. Generally no more than about five minutes of treatment in one area is necessary with ice massage. Compression wraps, such as elastic bandages, may be used to help provide mechanical support for the tendon during active movement. These compression wraps can be helpful, but they may also slow the healing process in the tendon if left on for long periods because they decrease blood supply in the area. Various types of soft tissue manipulation are very effective for treating tendinitis and may be employed by a variety of practitioners, including chiropractors, massage therapists, physical therapists, and osteopaths. One of the most common methods of soft tissue treatment for tendinitis is a vigorous friction massage to the damaged tendon. This friction massage will stimulate the healing of tissue in the area. It is also thought to help produce a healthy and strong scar-tissue repair of the damaged tendon fibers. Practitioners of manual therapy are also likely to advocate a regular stretching program to help decrease tension in those muscles that may be pulling excessively on the tendon. Acupuncture and traditional Chinese medicine are quite effective in treating tendinitis. Acupuncture may be used in the immediate vicinity of the tendinitis to help address muscular dysfunction. Acupuncture treatment may also use more distant points along the energy meridians to help address pain and reduce inflammation. Acupuncture may also have significant benefits in creating an optimum environment for healing of the tendon fiber to take place. Topical liniments and herbal preparations are often used to treat tendinitis. They have anti-inflammatory properties and will help heal the torn tendon fibers. If the condition is chronic, treatment with moxibustion (burning a small amount of mugwort near the skin) may hasten the healing process. Some oral herbal preparations may also be used in order to create the optimal healing environment for the tendon and address any underlying problems. Practitioners of traditional Chinese medicine may also use a special form of acupressure massage called tui-na. Pain and anti-inflammatory medications (aspirin, naproxen, and ibuprofen) will help and are often used to treat tendinitis along with ice, compression wraps, and activity modification, as mentioned earlier. Sometimes the inflammation lingers and requires additional treatment. Injections of anti-inflammatory medication, such as cortisone, often relieve chronic tendinitis, but they should be used with caution. Research has indicated that cortisone may have detrimental effects on the healing of connective tissues and may, in fact, weaken them in the long run. This side effect would make the person susceptible to a greater injury in the future. If tendinitis is persistent and unresponsive to nonsurgical treatment, the afflicted portion of the tendon can be removed through surgery. Surgery is also performed to remove the calcium buildup that comes with persistent tendinitis. Generally, tendinitis will heal if the activity that provokes it is stopped. Various kinds of treatments may accelerate the healing process. Some tendinitis complaints may last for a long time because they are not given adequate healing time before the individual returns to a vigorous level of activity. If given enough time, tendons will strengthen to meet the demands placed on them. The blood supply to tendons is poor, which means that tendons grow slowly. Therefore, adequate time is required for good conditioning. Stretching the muscles that are associated with problematic tendon will also help decrease overuse of the tendon.